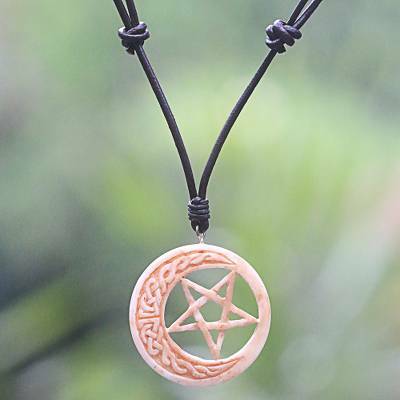 Hand Carved Moon and Star Necklace in Leather and Bone, "Celtic Moon Star"
A five-pointed star nestles in the embrace of the crescent moon, engraved with a Celtic knot motif. Realistically carved by hand, the bone pendant graces a necklace by Made Wardika. He colors the carving by soaking it in tea and displays it on a cord of dark brown leather.